Cover: At the top, looking out, are Herupa Hando Hu and Nadia Safir. Behind them, to the left of the cover, are Martian Manhunter and Mr Miracle. In front of them, top row, left to right are Gregorio de la Vega; Betty Clawman; Tom Kalmaku; and Celia Windward. The next row down are Floronic Man; Takeo Yakata; and Xiang Po. The heroes at the bottom are Batman; Halo; Blue Beetle; Flash; and Green Lantern Hal Jordan. To the right of Celia, standing in the background, are Geo-Forces; GL Guy Gardner; Wonder Woman; Wildcat; and Jade. Sat in front of Jade is Janwillem Kroef. Page 1: Herupa Hando Hu and Nadia Safir, the latter of which makes a very big claim. Page 2 – Panel 1: The Chosen sit before the Guardian and Zamaron. Left to right are Floronic Man; Celia Windward; Gregrio de la Vega; Tom Kalmaku; Betty Clawman; Takeo Yakata; Xiang Po; Nadia Safir; Herupa Hando Hu; and, rather pointedly on his own, Janwillem Kroef. Page 2 – Panels 2 to 10: There’s not a great deal to add to these panels, except perhaps to note that Panel 4 shows Takeo Yakata looking at Xiang Po; in the previous issue, Xiang admitted to herself that she was attracted to Takeo and it appears Takeo is interested in her. Page 3 – Panel 2: Herupa gets a bit metafictional as a fictional character describes their reality as real. Page 3 – Panel 4: The orange explosion behind Herupa is an actual burst of light, not an in-story representation of what he’s saying. Page 3 – Panel 5: In the sky is the newly arriving Superman. Page 4 – Panel 1: Superman arriving at the Green Lantern Citadel; he mentions the burst of light from the previous page. Page 4 – Panel 4: Superman is justifiably pleased with himself having helped free Lana Lang and the rest of Smallville from the Manhunters’ control and wonders what else he can do to help. Page 6 – Panel 1: Nadia Safir continues the Teaching of the Chosen. Page 6 – Panel 2: Considering this is (in real time) just a few years after the CRISIS ON INFINITE EARTHS, you could argue that it’s early on in the relationship between Superman and Batman, hence Superman’s surprised that Batman has been instrumental in destroying the Manhunters’ base. Page 6 – Panel 3: For the same reason, Batman still has some professional jealousy about Superman. Page 6 – Panels 4 to 6: Batman recounts the discovery and destruction of the Manhunters temple, events that were detailed in DETECTIVE COMICS #582 and THE SPECTRE #10, both covered in more detail in Crossovers Week 4. Page 7 – Panel 1: Batman ponders why it snowed at the end of his adventure. Page 7 – Panel 3: Captain Atom remembers meeting the Suicide Squad – left to right are Captain Boomerang; Rick Flag; Deadshot; Bronze Tiger; Slipknot; Karin Grace; and the Privateer – but doesn’t mention them aloud for fear of exposing himself. At this point, Captain Atom works for General Eiling and the government and is actually spying on the Justice League for them. Page 7 – Panel 4: Captain Atom explains that it was Firestorm who caused the snow; this and the meeting with the Suicide Squad hapened in SUICIDE SQUAD #9 and CAPTAIN ATOM #11, again both covered in more detail in Crossovers Week 4. Page 7 – Panel 5: Jim Corrigan – alter ego of the Spectre – keeps his secret. Page 7 – Panel 6: It’s almost as though Superman has to tell them he’s had some success as well. Page 8 – Panel 1: Brainwave reveals that the Manhunters have taken serious losses with the fall of their temple. He also mentions the Harlequin – this is Marcie Cooper who was revealed as both the Harlequin and a Manhunter agent in INFINITY INC #46 in Crossovers Week 3. Page 8 – Panels 4 and 5: Insensitive much, Arisia? Page 8 – Panel 4: Halo’s mention of the Outsiders taking losses refers to the deaths of Dr Jace (who, while a Manhunter agent, had been the team’s friend for some time) as well as Metamorpho, their team-mate. These events were shown in THE OUTSIDERS #27 in Crossovers Week 1. Page 8 – Panel 5: Despite halo’s obvious grief, Arisia suggests having some food and drink to get over it. Not sure if she does “sound like an American” but she certainly sounds insensitive. Page 8 – Panel 6: Post Crisis, Wonder Woman’s first appearance was in the pages of LEGENDS which had been released just the year before, explaining why she was keen to get to know the people here. Page 8 – Panel 7: Flash’s father was revealed as a Manhunter way back in issue #1, while the plot to kill Flash’s mother was shown in FLASH #8 in Crossovers Week 1. Page 8 – Panel 8: Martian Manhunter and Mr Miracle saw Nadia stumble and appear week in the previous issue, Pages 9 and 10. Page 8 – Panel 9: Kim Liang wonders about Mr Bones’ heritage while he sees her looking. Page 9 – Panel 1: Herupa continues the Teaching of the Chosen. Page 9 – Panel 2: On the lawn of the White House where President Reagan is just boarding Marine One. Page 9 – Panel 3: President Reagan and, in the bottom left, Nancy Reagan who was revealed as a Manhunter agent in issue #3. Reagan is told of the Manhunters taking a hit and replies that he is happy. Page 9 – Panel 4: The reporter claims that this position is “precisely the opposite” of Reagan’s previous position, an assertion that I reject – Reagan is show in issue #3 asking the heroes to hurry up and sort the situation out, but at no point has he expressed support for the Manhunters. Page 9 – Panel 7: Tawny Young, recruited by the Manhunters in issue #3 to bury the story. Page 9 – Panel 8: Nancy has apparently assured the President that the Manhunters are gone but he still has doubts. As far as I’m aware, this is the last appearance of Nancy in the MILLENNIUM crossovers and nothing more is ever said of her being a Manhunter agent. Page 10 – Panel 1: Nadia Safir continues the Teaching of the Chosen. Page 10 – Panel 4: This is a heavy-handed reminder that Xiang and Takeo are attracted to each other. Page 10 – Panel 5: Despite the other Chosen offering comments on the Teaching so far, Janwillem Kroef remains silent. Page 11 – Panel 1: Nadia Safir continues the Teaching of the Chosen. Page 11 – Panel 2: Geo-Force notices his teammate Looker in pain. Page 11 – Panel 3: Somewhat abruptly, Looker has received a message from her homeland and needs to help them. Page 11 – Panel 4: This is really clunky dialogue from Engelhart. Page 11 – Panel 5: Weirdly, without being part of the conversation or even looking at the speakers, Firestorm appears to be agreeing with Windfall that Batman won’t be happy. Page 12 – Panel 1: As the Outsiders leave, Batman takes off after them, cutting Mr Miracle off in mid-sentence. Mr Miracle mentions “Dunninger” which would presumably be the contemporary of Harry Houdini, Joseph Dunninger. Mr Miracle is a renowned escapologist, as was Houdini, but a look at Dunninger’s Wikipedia article makes no mention of escapology. 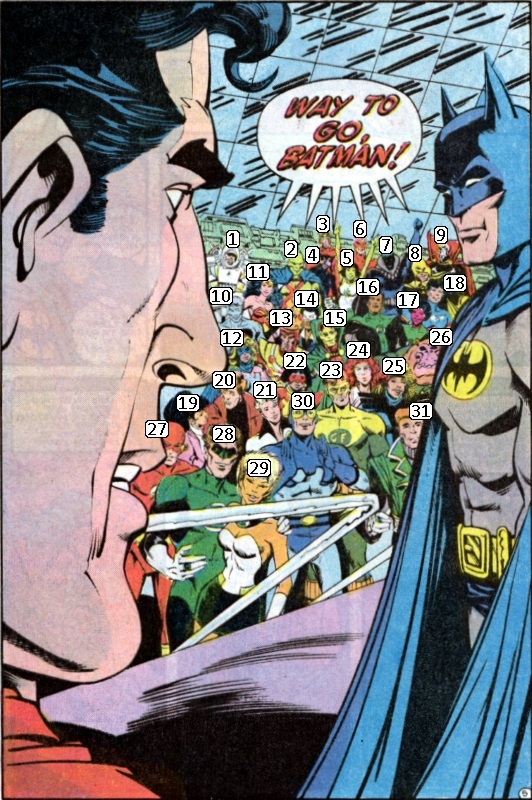 Page 12 – Panel 3: Batman heads out to see the Outsiders disappearing in their craft. To be honest, they must have really sped up after leaving the hall as Batman was only seconds behind them, but here they’ve all managed to get to wherever their ship was parked, get in, and head off way before Batman caught up. Page 13 – Panel 1: I’m uncertain why Blue Beetle is laughing here; is it because of Black Canary’s comment? She’s referring to Oliver Queen, Green Arrow, but he isn’t here as per the crowd scene on Page 5. Page 13 – Panel 2: Jade’s comment refers to the press conference Booster Gold held in BOOSTER GOLD #24, covered in Crossover Week 3. Obsidian has long been over-protective of his sister, hence his comment. Page 13 – Panel 3: I can only assume Canary is telling a story that makes Beetle laugh, here; the GLs Katma Tui and John Stewart are married to each other. Firestorm was convinced by Captain Atom (in CAPTAIN ATOM #11 as shown in Crossover Week 4) that being good is inherently better than being bad, which is why the slightly simple minded GL Guy Gardner is so impressed. 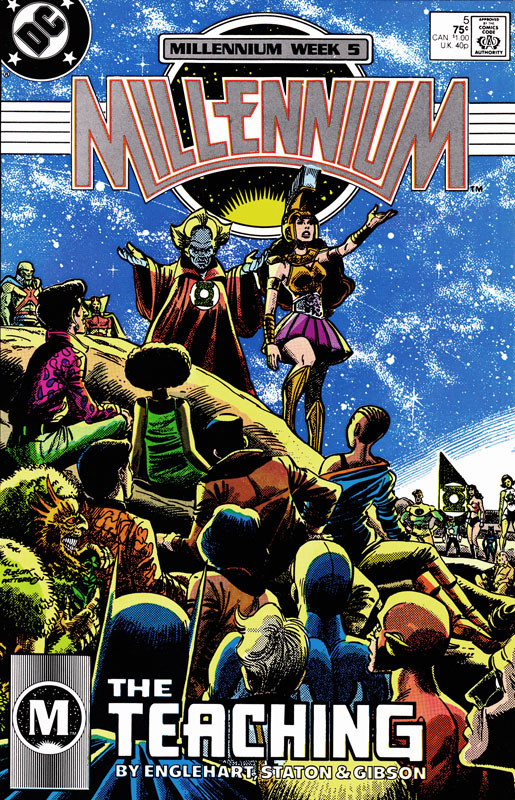 Page 13 – Panel 4: Wonder Woman mentions the “challenges from the gods” which is the story arc over in her own series that MILLENNIUM is interrupting. Pan, despite being a Manhunter agent, sent her off to join the other heroes in WONDER WOMAN #12, as seen in Crossover Week 1. GL Hal Jordan refers to Barry Allen, the Flash before Wally West, who died during CRISIS ON INFINITE EARTHS. Page 13 – Panel 5: Wonder Woman assumes there’s a relationship between the Zamarons and the Amazons which is random to say the least. Is it based on the vague similarity between the Zamarons’ armour and that of the Amazons? Page 13 – Panel 6: Either way the question is moot as Wonder Woman disappears in a burst of light. Page 14 – Panel 1: Herupa continues the Teaching of the Chosen. Page 14 – Panel 3: On the right of the panel, joining the party, are Aqualad and Aquaman. Page 14 – Panel 5: The heroes quickly bring Aquaman up to speed regarding the Manhunters, but he has a surprise outside. Page 15 – Panel 1: This is the flying saucer that Aquaman and Aqualad found the Manhunters trying to retrieve in TEEN TITANS SPOTLIGHT #18, covered in Crossovers Week 4. Page 15 – Panel 3: Yes, Aqualad did actually say the Manhunters were using “bionic jellyfish submarines” to try and rescue the flying saucer. Page 15 – Panel 5: This makes the heroes realise that while there are next to no Manhunters left on Earth, they can be replaced from space. Page 16 – Panel 1: Nadia Safir continues the Teaching of the Chosen. Page 16 – Panel 2: Superman and Batman realise the efforts of the heroes have been too narrowly focused. Page 17 – Panel 1: Why didn’t you say that earlier? 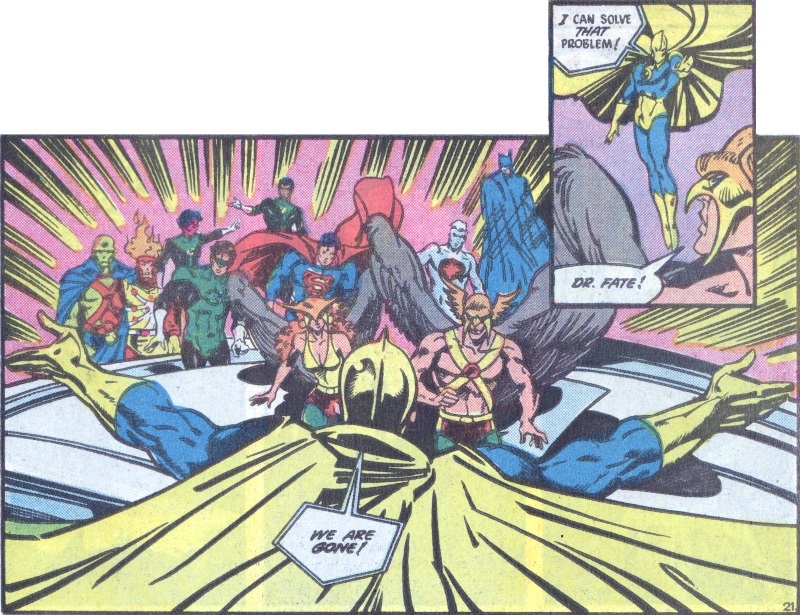 Page 16 – Panel 3: As Martian Manhunter says, even the Justice League International, formed at the end of LEGENDS, is too limited. Page 16 – Panel 4: And Brainwave repeats his claim that he can’t sense any Manhunters. Page 16 – Panel 5: Captain Atom puts forward the idea the Manhunters will have a fleet of ships. Page 17 – Panel 1: And only now does GL Hal Jordan remember that he knows where the Manhunters secret home world is. 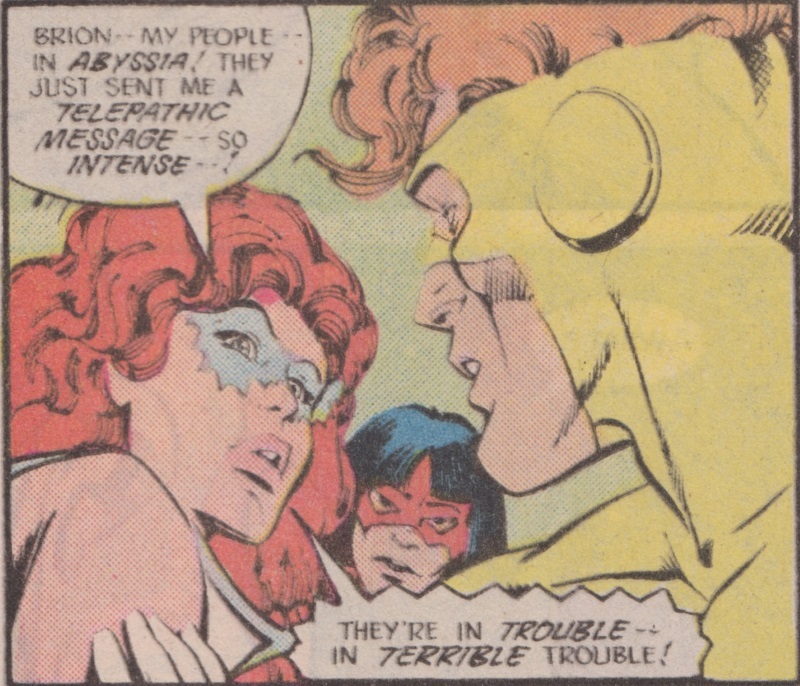 Page 17 – Panel 2: Canary refers to the old JLA fighting the Manhunters on their home world; that would be in JUSTICE LEAGUE OF AMERICA #140 and #141. Page 17 – Panel 3: And Superman’s itching to get in on the fight. Page 17 – Panel 6 and Page 18 – Panel 1: Herupa continues the Teaching of the Chosen. Page 18 – Panel 2: And we’re back with Harbinger on the Manhunter home world of Orinda where we saw her in the previous issue. Page 18 – Panel 5: This Green Lantern is Driq and, helpfully, he’ll give us a run down of his origins on the next page. we last saw him on Page 21 of the previous issue. Page 18 – Panel 6: Driq frees Harbinger from the energy depletion machine. Page 19 – Panel 2: Though Driq can’t speak, he uses his power ring to relate his story to Harbinger. 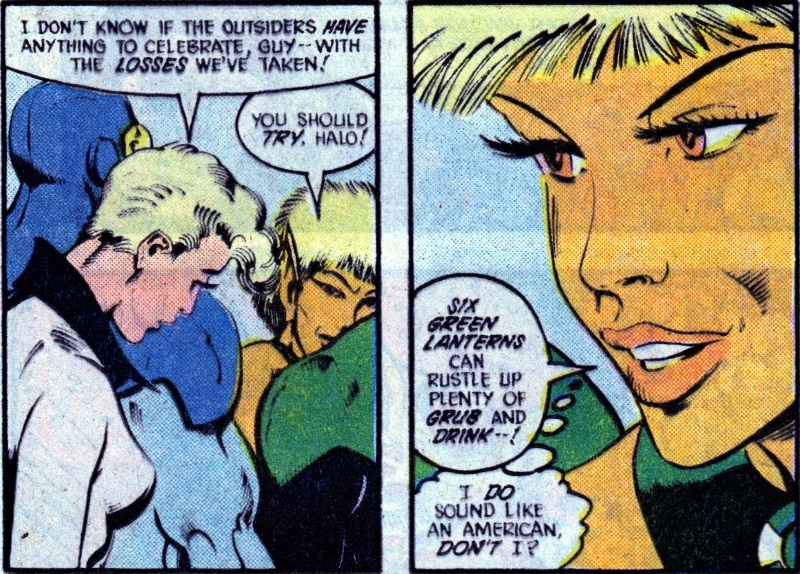 Page 19 – Panel 3: These are the Green Lanterns of the Klyminade, a sector of space near Earth’s, and which were mentioned in GREEN LANTERN CORPS #217 which was written by Steve Englehart. The top row are Olapet; an unnamed GL; Driq (looking a little healthier here); and Flodo Span; the two below are both unnamed. GREEN LANTERN CORPS #217 mentions that there were eight GLs in this group but the only survivors were Olapet, Flodo Span and, because his ring would not allow him to die, Driq. Page 19 – Panel 4: This is Sinestro, seen in flashback to the same issue of GREEN LANTERN CORPS mentioned above. Page 20 – Panel 1: With the exposition dealt with, Driq helps harbinger escape. Page 20 – Panel 2: But watching them escape is . . . Page 20 – Panel 3: . . . the Grandmaster of the Manhunters. Page 20 – Panel 4 and Page 21 – Panel 1: Nadia Safir continues the Teaching of the Chosen. Page 21 – Panel 2: Hawkman and Hawkgirl arrive at the Green Lantern Citadel to help out. Page 21 – Panel 3: Now everyone’s assembled, the question becomes how to get to Orinda? Page 21 – Panels 4 and 5: Did anyone order a deus ex machina? Dr Fate arrives and transports the team off the face of the Earth. Page 22 – Panels 1 and 2: Blue Beetle is left pondering the flying saucer and something about it raises his suspicions. Page 22 – Panels 3 to 5: Herupa and Nadia finish Teaching the Chosen. The entire text of the Teaching can be found on this page.